Sky watchers in the US state Arizona were blessed with clear skies during the whole transit. 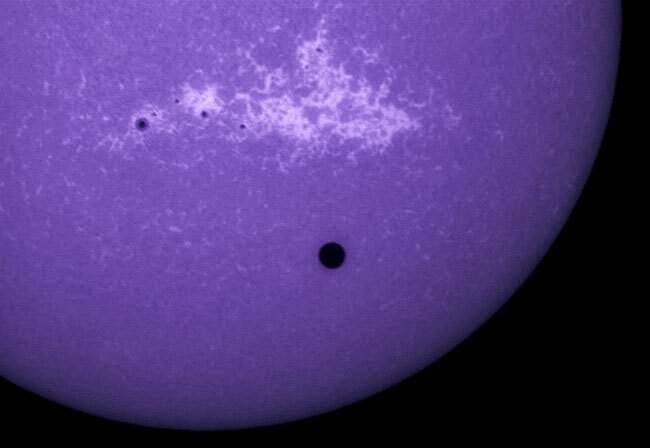 One of the lucky observers caught this photo of Venus passing the sun on June 5 using a calcium filter in the ultraviolet spectrum. Note the large solar storms in the top centre of the image. The photo was taken by Nick Howes at Meteorite Men Headquarters in Tucson, AZ. Singapore was completely overcast all morning so we missed it. What a great picture. Thanks.